Whiplash has been garnering a lot of attention and I had the pleasure (?) of seeing it this past weekend. 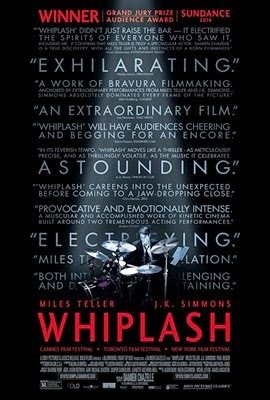 I add that question mark as it's hard to say whether Whiplash is an enjoyable experience, the subject matter is so painful to watch. It's a film which had me squirming in anxious anticipation for much of its 107 minute running time. Andrew (Miles Teller) is a young graduate student at a prestigious music school, hoping to get noticed along with the rest of his aspiring colleagues. He plays the drums and is by all accounts fairly mediocre. However, he possesses an obsession and determination which is only brought to the fore when he is invited to play with the best jazz band on campus, conducted by the formidable Fletcher (J.K Simmons). Unaware of what he's letting himself in for, Andrew is publicly humiliated by his tutor in his very first rehearsal. It seems that Fletcher will stop at nothing to gain the perfection he so desperately seeks from his students. For someone who considers themselves a perfectionist and who can be thrown into a tailspin at the mere whiff of failure (seriously, I can lose perspective with style), this was uncomfortable viewing. Simmons is brutal as Fletcher, hurling violent insults and game playing with the young musician who becomes obsessed with his ability to play the part right, like one of the greats. Directorial choices by writer/director Damian Chazelle work well with a lot of shots focused on face and hands as the sweat pours and the blood runs. There is an intensity to this film that means even when there is little in the way of dialogue, we are transfixed, fully immersed in the drama and uncomfortably anticipating the next way Fletcher is going to screw with Andrew. Teller and Simmons are combative and bring great energy to their parts. The ideas expressed in the film are somewhat nuanced in that the audience is privy to the damaging effect Fletcher's methods can have on his students. However, as we reach the conclusion, we're left wondering what the cost of brilliance really is, and whether the ends justify Fletcher's means.